I thought I had started to make these in plenty of time for Christmas. Some of you may have spotted the sneak preview of this project on my facebook page back in November. Unfortunately (the best laid plans of mice and men… ) a couple of days later I fractured my elbow, which meant I had to come to terms with only finishing the ones I had printed in my trial run. I guess there is always next year. 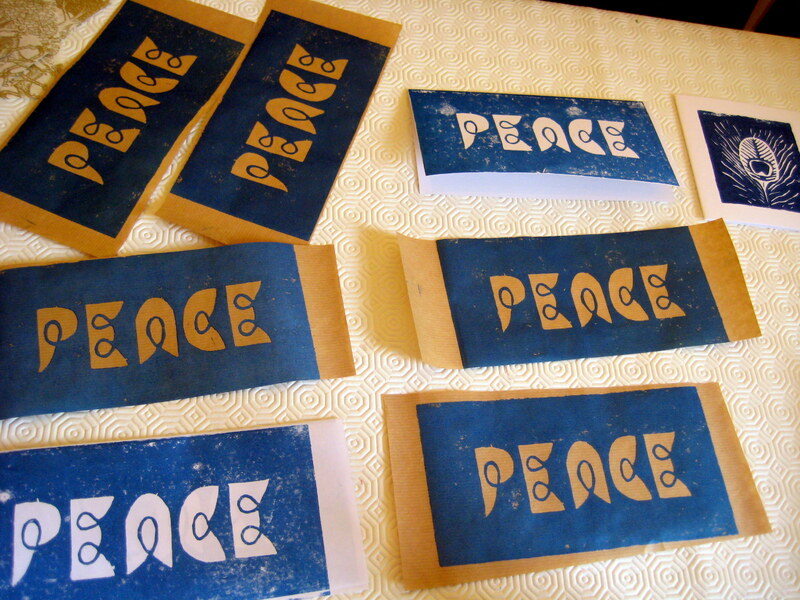 Linoprinted Christmas cards… good for making lots of cards at once! I made these using a design I sketched and cut using my newly acquired linoprinting skills. I really enjoy this process as it enables mass production from one block. If you can call 8 cards mass production, that is. 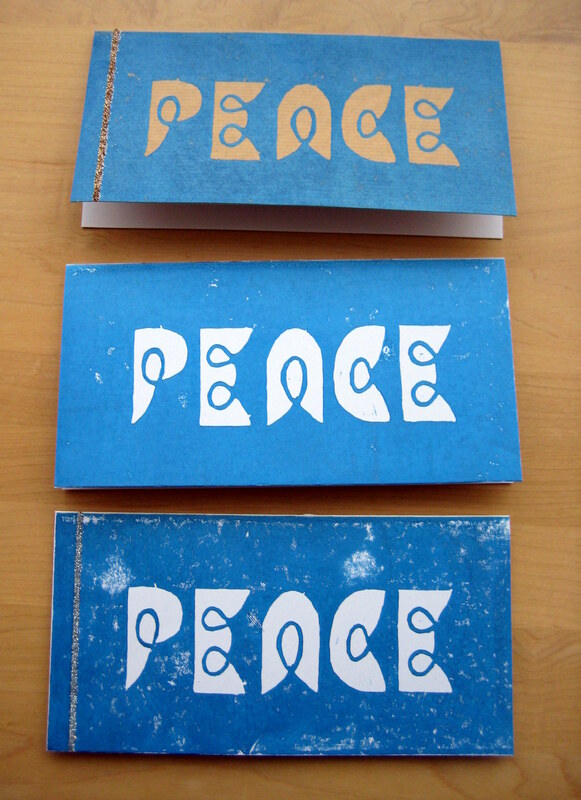 They are the same but all slightly different because the ink does not always print perfectly. I quite like this effect, as they are still unique. I chose a metallic blue ink and tried it straight onto the white cards I had, and also onto brown paper. I’m quite pleased with them both. 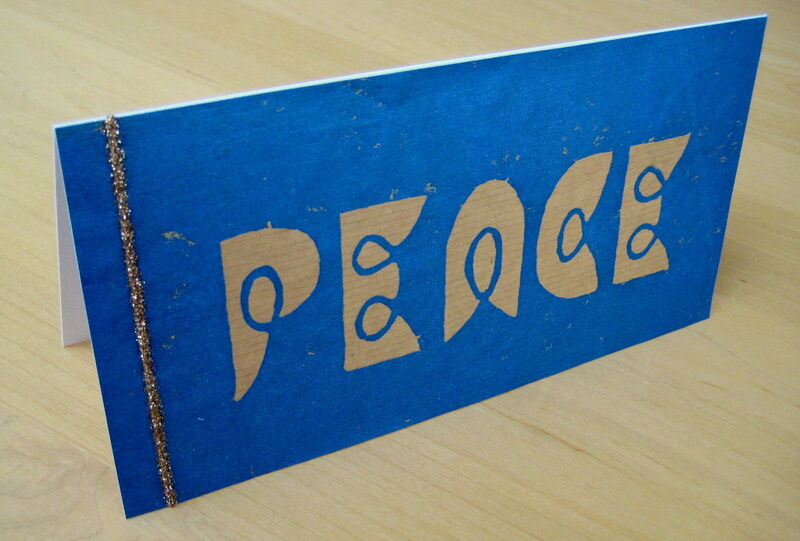 Wishing you peace at Christmas time… via a linocut card! In the end I just added a simple line of glitter to add some Christmassy bling. I like to use tulip paint for this, as it is 3D, and then cover it with glitter, tap off the excess and leave it to dry overnight. I used bronze glitter on the brown paper prints and silver glitter on the white card prints. Next year I may re-use this block and try different colours, what do you think? I like the design! Your lino cutting is impressively neat too, did you have to practice much? Such a great idea for making lots of homemade cards without it taking forever!